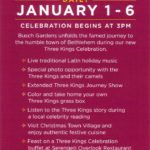 Three Kings Celebration is a new event that debuted at Busch Gardens Tampa (and at SeaWorld Orlando) on New Year’s Day in 2018, running through January 6. 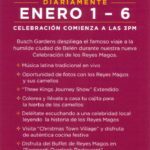 (A) cultural celebration boast(ing) authentic Latin traditions, live entertainment honoring the three wise men and Busch Gardens’ dazzling display of twinkling lights. A two sided card was handed out to guests at the park parking lot toll booth at the end of December 2017 to help promote the new event. Additional images and details on Three Kings Celebration will be added in the future.